When you visit Cave of the Winds Mountain Park, you’ll discover adventure above and below ground! First, choose a cave tour and then decide from three Above Ground packages that are sure to please every member of your family! A guided, educational walking tour for families and beginning cavers. Summary: Our most popular family tour! A longer, deeper exploration into the mountain, illuminated by lanterns. Hear about ghost stories, folklore, and spooky history. Summary: A spooky historical adventure. Climb and crawl through undeveloped sections of the Manitou Grand Caverns. Summary: Take an exciting cave trek! Frequency: Times vary through the year. Perfect for families! Explore and soar when you choose this fun aboveground package! See descriptions below. Summary: Includes Wind Walker Challenge Course, Bat-A-Pult, Cliff Hanger Climbing Wall, Geronimo’s Leap, and Magic Lantern Virtual Reality Theatre. Upgrade your adventure to our Explorer Package that includes all the fun of our aboveground adventures PLUS the TERROR-dactyl! See descriptions below. Summary: Includes Wind Walker Challenge Course, Bat-A-Pult, Cliff Hanger Climbing Wall, Geronimo’s Leap, Magic Lantern Virtual Reality Theatre, and a single ride on the Terror-dactyl with a reservation. Choose our ultimate adventure package that includes a full day of entertainment! Includes our NEW Via Ferrata Canyon Tours and a ride on the TERROR-dactyl! See descriptions below. What will I do on a Discovery Tour? Explore the electrically lit portion of Cave of the Winds on a 45 – 60 minute guided walking tour which includes 15 rooms, a 1/2 mile of concrete walkways, and 196 stairs. On this family-friendly tour, you will learn about the history an geology of the cave while being shown some of the most beautiful formations. Note: Baby front carriers are recommended for small children. Due to low ceilings, narrow passages, and stairs baby backpack carriers and strollers cannot be accommodated while on the Discovery Tour. You may also carry your child in your arms, or let them walk if they are able to do so. How often do you have Discovery Tours? Depends on what time of year you come. Summertime (June – August): We have tours daily starting at 9 a.m. Discovery Tours leave every 20-30 minutes. Last tour leaves approximately 1 hour prior to closing. Wintertime (September – May): We have tours daily from 10 a.m. – 5 p.m. Tours leave every 30-40 minutes. Last tour leaves at approximately 4:30 p.m.
What should I bring for a Discovery Tour? Comfortable walking shoes, a light jacket, and your sense of adventure! From May 24th through September 2nd you can experience our most popular family tour at a discounted price! Choose either the Early Riser or the Happy Hour tour. Early Riser and Happy Hour tickets must be purchased online. What will I do on a Lantern Tour? Explore, by candlelight, the mysterious and unimproved Manitou Grand Caverns on a 90-minute guided tour which includes nearly a mile of walking. Like the adventurers of the past, you will navigate dark narrow tunnels, low passageways, uneven stairs, and rooms with muddy, original floors. Along the way, you will learn the history of Cave of the Winds as well as the frightening folklore, scary ghost stories, and unexplained phenomena of the Manitou Grands. Note: Children under the age of 6 are not permitted. Also, this tour includes a 250-foot long narrow passage that ranges from 42″ – 48″ inches tall. Therefore, it is not recommended for guests with knee or back trouble. This tour is also not recommended for persons who are easily frightened by ghost stories. How often do you have Lantern Tours? Depends on what time of year you come. Summertime (June – August): We have tours daily from 9 a.m.-7 p.m. Tours leave on the hour. Exceptions may apply, please see Hours of Operation for August. Wintertime (September – May):Tours are available daily starting at 11 a.m.
What should I bring for the Lantern Tour? Bending down and shuffling your feet is required, so wearing athletic shoes is highly recommended. Please keep in mind your shoes may get muddy while on this tour. From May 24th through September 2nd you can experience our Lantern Tour at a discounted price! Choose either the Early Riser or the Happy Hour tour. Early Riser and Happy Hour tickets must be purchased online. What will I do on the Caving 101 tour? Explore the wild, undeveloped depths of the Manitou Grand Caverns on the 2 – 2.5-hour guided tour that involves an assortment of crawling, climbing, and walking through wet and muddy passages of various sizes. On this tour, you will crawl/climb/walk for nearly a mile while learning basic spelunking skills and the history as well as geology of the cave. Note: Children under the age of 13 are not permitted. This tour is also not recommended for guests who have back or knee trouble. How often do you have Caving 101? The Caving 101 Tour will be offered Saturdays only at 10:00am, 3/1/19 – 4/30/19. Memorial Day – Labor Day Caving 101 Tours will be offered on Sundays and Mondays only at 8:00pm. What should I bring for a Caving 101 tour? A change of clothes and an extra pair of sturdy athletic shoes – crawling is required and the cave is often muddy. Please wear clothing you won’t mind getting dirty and possibly ruined by mud. The cave is 54 degrees year round and humid, so please dress with this in mind. Frequency: The Caving 101 Tour is offered at various times of the year. Journey into a virtual world in our Magic Lantern Virtual Reality Theatre! Our new ride will transport you to a virtual world where you’ll experience soaring aerial views, speed and the excitement that thrill seekers crave! This ride is included in all of our above ground ticket packages and a real thrill for the whole family! From May 24th through September 2nd you can experience the Pioneer Package at a discounted price! Choose either the Early Riser or the Happy Hour. Early Riser and Happy Hour tickets must be purchased online. You won’t need nerves of steel for our Via Ferrata and our Frontier Zip Line but you will need an adventurous spirit for outdoor climbing and zipping fun! Created in the mountains of Europe, the Via Ferrata is a system of cables and ladders that helped World War 1 soldiers navigate the front line between Austria, Hungary and Italy! You will be connected to our Via Ferrata track cable for an exhilarating climbing activity through spectacular mountain terrain on a two hour guided tour under the close supervision of our experienced guides. Our knowledgeable guides will lead you around limestone cliffs and mountain paths high above the canyon floor. The excitement of vertical canyon walls, zip lining fun and amazing views will make for a perfect Colorado Adventure! Our course is geared toward the inexperienced climber. Our safety equipment is designed to keep you on course. Each climber will be provided with a specially designed Via Ferrata harness system, helmet and gloves. You must wear sturdy hiking /climbing footwear. This tour is an unforgettable Colorado experience! How much does it cost to take the tour? $99 per person, per tour. Can be purchased separately or as a part of the Mountain Man Package. Requirements: Participants must be 48″ tall and weigh between 90lbs & 260lbs and must be ages 12 and up. Guests 12-17 must be accompanied by an adult. How long is this tour? Our Via Ferrata, an adventure that is part hiking and part climbing, is about 3 1/2 hours. HANG ON TO YOUR SEAT! Get ready to take to the skies on the Bat-a-Pult, an epic, 1200-foot round-trip aerial attraction high along the wild and beautiful Williams Canyon. The ride leaves from its roost high in the rafters of our Pavilion, launching you on an epic, 1,200-foot round-trip flight across Williams Canyon at speeds of nearly 40 mph. For little ones, you can experience the thrill with Mom or Dad right at your side! Pioneer Package: $30 per person The Pioneer Package includes unlimited rides and access to the Bat-a-Pult, Wind Walker Challenge Course, Cliffhanger Climbing Wall, and Geronimo’s Leap. Explorer Package: $75 per person The Explorer pass will include the Pioneer Package plus one ride on the Terror-dactyl. Requirements: Anyone who is 42” tall, young or old will love this ride! Get ready to slice through the air during the day or, if you’re daring, between dusk and nightfall, just like a bat! Experience fun and adventure on our unique 3-story obstacle course, the Wind Walker Challenge Course. Balanced atop the edge of Williams Canyon, with a 600 foot drop, the Wind Walker Challenge Course will thrill you with its maze of steel beams, ropes, and ladders. How hard is the course? This 3-story course is guaranteed to be fun for all ages. There is even a spot where you can venture out and peer directly down into Williams Canyon, if you are up for the extra challenge. How does it work? After being placed in a full-body harness and attached to an overhead tracking system, you will be able to navigate through the Wind Walker Challenge Course. How does it work? 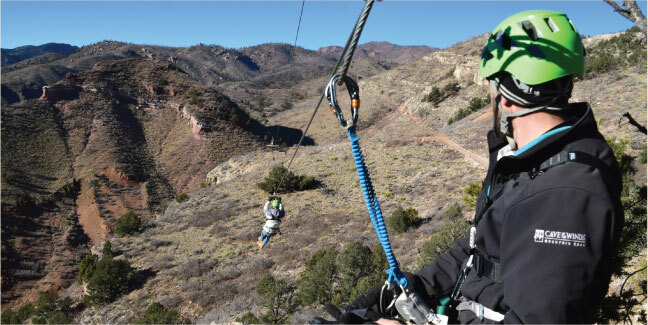 Once you are securely strapped in, you will free fall over 150 feet into breathtaking Williams Canyon. Your shrieks and laughs will echo through the canyon, and as you swing back and forth over the canyon floor, you’ll be planning to ride the Terror-dactyl again! Requirements: Guests must be at least 48 inches tall, and between 100 – 250 pounds to ride. From May 24th through September 2nd you can experience the Terror-Dactyl Pass at a discounted price! Choose either the Early Riser or the Happy Hour. Early Riser and Happy Hour tickets must be purchased online. Just like miners used to pan for gold during the gold rush, relive what it was like to be a Colorado adventurer and pan for your very own gemstone collection at our Sluice. Everyone is guaranteed to find some! Panning for gemstones is fun for the whole family, and kids get a kick out of finding their own souvenirs to bring home. Learn a little about the history of Cave of the Winds and its discovery by visiting the Josephine Snider Nature Center located next to the cave entrance. Caver’s Cafe will save the day whether you need a soda, water, ice cream, or a snack! Then stop by Pickett’s Mercantile Gift Shop to pick up some souvenirs, unique gifts, tees and sweats, caps and hats, knives, jewelry, books, glassware, kid’s stuff, unique snacks, Colorado memorabilia, and much, much more. Established all the way back in 1881, Pickett’s is open year-round to the public.